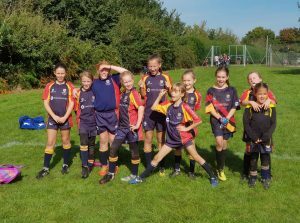 Chobham Rugby Club is recognised by the RFU as one of the leaders in Girls’ Rugby development, and has a vibrant girl’s section from Minis to U18s. We are a partner club with the Harlequins Foundation and their ‘Switch’ programme which gives our girls access to additional coaching and other opportunities. The Mini Girls from U9 – U11 train on a Sunday morning at 9.30am over on our Orchard pitch. Please contact William Veats – girlsrugbychobham@gmail.com for more information. 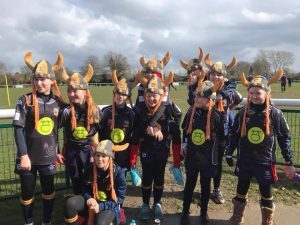 The emphasis is on fun and the girls also play in a number of U11 festivals throughout the season. Last year they also went on Tour with the Minis section and had a fabulous time. Our Lead Coach is Izzy Fisher, who is an ex-Chobham girl, current Wasps Ladies player in the TP15s and an RFU Level 2 Coach. She is ably assisted by William and Jake and a number of other talented coaches. Our girls vary in experience from County players to complete beginners. Everyone is welcome and we aim to be inclusive and for all our girls to develop their individual skills, whether just for fun or as potential England players! 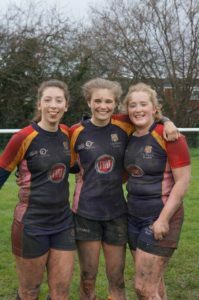 This season, our U18 girls will be playing with Cobham RFC to enter the National Cup, whilst our U15s and U13s will play in the Surrey Cup and also have a full programme of friendly fixtures and festivals. If you are interested in playing, whatever your age or experience, please contact Jo Fisher 07884 000049 or jomarkfisher@aol.com or alternatively just come along on a Friday! The Junior Girls – U13, U15 and U18 (School years 7- 13) train on Friday evenings from 6.30-7.30pm and on Sunday from 11.45am – 1.15pm if we don’t have a match.